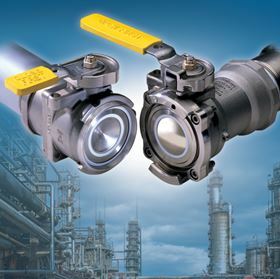 The Epsilon™ Dry Disconnect Couplings feature a series of design and operational features that make them ideal for use in critical in-plant and railcar/tank-truck chemical-transfer applications in pharmaceutical manufacturing. Examples of volatile, hazardous or high-value pharmaceutical compounds whose transfer can benefit from the use of Epsilon disconnects include dichloromethane, toluene, ammonia (23%), pharmaceutical slurries and Syltherm. OPW says what sets the Epsilon apart from competitive dry disconnect technologies in these applications is a design that utilizes ball valves rather than poppets to facilitate the opening and closing of the coupling. This unique construction allows a convex ball to seat with a concave ball when the valve is opened, producing a straight-through flow path that creates no areas where chemicals can nest. The result is fluid transfer that experiences no reduction in flow rate while virtually eliminating the occurrence of product spills when the coupling is disconnected. A series of five independent and redundant mechanical locks also prevents the Epsilon coupling from becoming accidentally disconnected, which removes the threat of unintentional spills and catastrophic chemical releases. Capable of operating in humid and dusty environments, the AWS and AWD units by Atlas Copco are designed to deliver vacuum to a variety of industries.